Ka‘anapali Coffee Farms occupies a piece of what was once a vast sugar cane plantation run by Pioneer Mill Company of Lahaina and Ka‘anapali. Now smaller farms line the slopes in a lovely emerald patchwork. Just 4 miles downhill, the storied Ka‘anapali Beach Resort hosts pleasure-seekers from around the globe. Ka‘anapali Coffee Farms is a private agricultural community that weaves contemporary island living into the rich farming culture of West Maui. 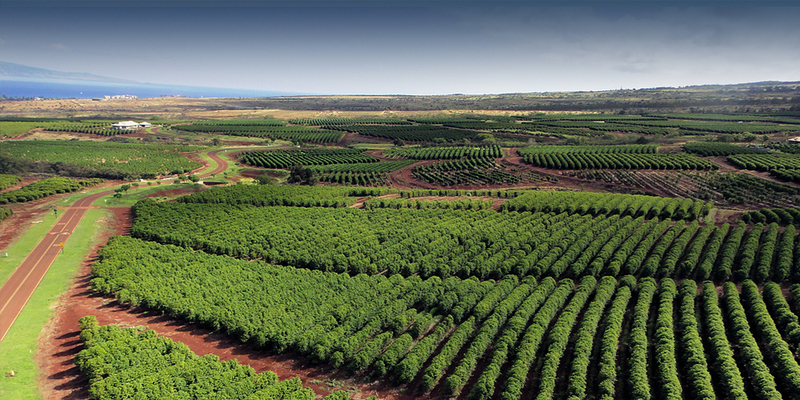 On approximately 500 acres upslope from Ka‘anapali Beach Resort, 4-to 7-acre Farm Lots are available. In keeping with the district's agricultural intent, each lot is a part of a working coffee farm. A veteran team of local farmers grows, harvests and markets the coffee crop on your estate, leaving you and your family the time to enjoy life in this remarkable corner of paradise. What else will you find flourishing on your private coffee farm? Your sense of wonder. Your connection with nature. Your children's horizons. The pleasure of belonging to a unique community in Hawai‘i where agricultural traditions and open space are preserved. © Kaanapali Land Management Corp.
Notice to Prospective Farm Purchasers: Obtain the Property Report required by Federal law and the Public Offering Statement required by Hawaii law and read them before signing anything. No Federal or State agency has judged the merits or value, if any, of this property, and registration with such entities does not mean approval or disapproval of the subdivision. This does not constitute an offer to sell or solicitation of an offer to buy where void by law. Prices and offers subject to change at any time.